Tulku Namgyal Rinpoche (b.1974) is a son of Shenphen Dawa Rinpoche. 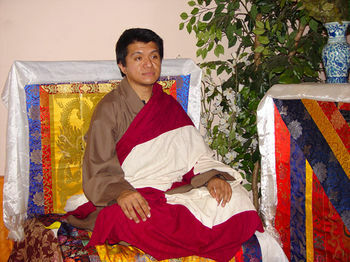 He has been recognized as a reincarnation of Garwang Sangye Dorje who was one of the main teachers of Dudjom Rinpoche. His mother is H.R.H. Ashi Pema Codon Wangchuk, a royal family member of Bhutan. Tulku Namgyal Rinpoche was enthroned by Dudjom Rinpoche himself, who blessed him and predicted his future. He received his education at St. Paul Catholic school in Darjeeling, for his higher school he attended Baha School, in Maharashta. Later he studied at Penor Rinpoche’s Namdroling Monastery and later in a Nyingma monastery in Kathmandu for further training in the Dharma. This page was last edited on 5 February 2016, at 13:40.